We report an unusual presentation of a case of Axenfeld-Rieger (A-R) syndrome. 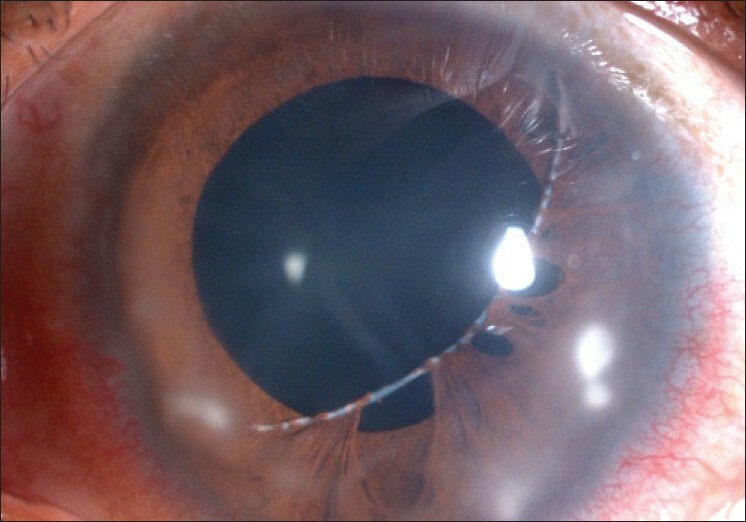 A 14-year-old male presented with gradual dimness of vision for 1 year and redness of left eye for 3 days. The patient had megalocornea with Haab's striae in the right eye and posterior embryotoxon in both the eyes. In the left eye, there was a white cord-like structure traversing the anterior chamber with adhesions to iris tissue along its course. On two antiglaucoma medications, his intraocular pressure (IOP) was 22 mm Hg in the right eye and 18 mm Hg in the left eye. Gonioscopy revealed a cord-like structure originating at the level of Schwalbe's line. He underwent right eye trabeculectomy with mitomycin-C. This case highlights a rare presentation of a strange cord-like structure, a rare presentation of A-R syndrome. Usual ocular findings in A-R syndrome involve cornea (megalocornea and prominent Schwalbe's line), iris (mild atrophy to severe degenerative changes like hole formation, correctopia and ectropion uvea) and angle (anterior insertion of iris, tissue strands bridging the angle from the peripheral iris to the prominent Schwalbe's line). Nearly 50% of the subjects present with secondary glaucoma. In A-R syndrome, Schwalbe's line usually appears as a prominent and anteriorly displaced white line in the posterior cornea near the limbus on gonioscopy. It may be incomplete (usually temporal) or complete (360°). Recently, Espana et al. reported an unusual bilateral detached Schwalbe's line in the anterior chamber in a patient with A-R syndrome. We report another unusual case of detached Schwalbe's line with attached iris tissue strands in the anterior chamber in A-R syndrome. A 14-year-old child presented with gradual painless decrease in vision in both eyes since 1 year and redness in the left eye since last 3 days. He was a known case of glaucoma for 6 months and was using timolol 0.5% and pilocarpine 2% eye drops in both the eyes. The patient was referred to glaucoma clinic with a probable diagnosis of a worm-like structure in the anterior chamber of the left eye. His best-corrected visual acuity was 20/50 in the right eye and 20/40 in the left eye. On examination, corneas of both the eyes were enlarged, horizontal diameter (white to white) measuring 14 mm in the right eye and 13 mm in the left eye. Haab's striae were seen in the right eye and posterior embryotoxon was seen in both the eyes [Figure 1]. The left eye also showed blepharitis and marginal keratitis. 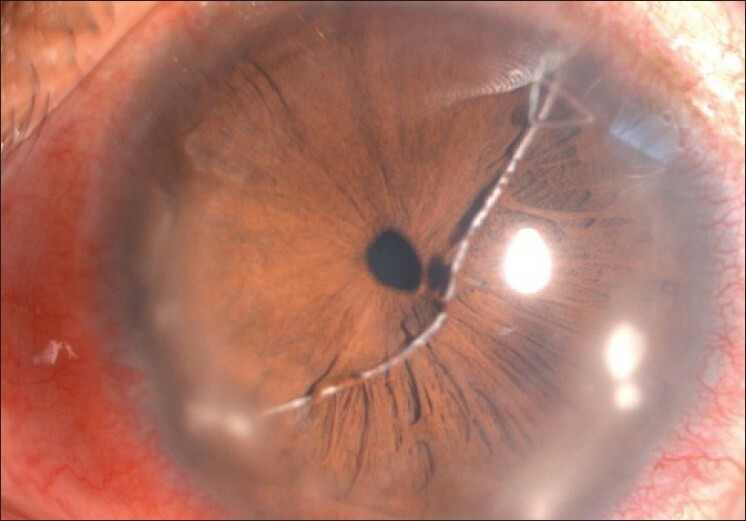 The most striking feature on slit-lamp examination was the presence of a white cord-like structure traversing the anterior chamber in both the eyes (more prominent in the left eye). This cord-like structure had adhesions to iris tissue along its course, more noticeable after pupillary dilatation [Figure 2] and [Figure 3]. Intraocular pressure (IOP) was 22 mm Hg in the right eye and 18 mm Hg in the left eye by applanation tonometry. Gonioscopy showed open angles in both the eyes with anterior insertion of iris into trabecular meshwork, prominent iris processes and broad-based synechiae at places. It also revealed prominent Schwalbe's line along the part of angle circumference, with cord-like structure taking its origin at level of Schwalbe's line [Figure 4]. Optic disk examination revealed small disks, 0.9 cup to disc ratio (CDR) with inferior notch and superior rim thinning in the right eye. Left eye showed 0.8 CDR with superior notch. Humphrey visual fields revealed superior and inferior arcuate defects in the right eye and an inferior arcuate defect in the left eye. Based on the above findings, our diagnosis was A-R syndrome with secondary developmental glaucoma. The cord-like structure probably represented a detached Schwalbe's line. The patient was advised timolol 0.5% in both the eyes and latanoprost 0.005% in the right eye. He was also given the usual treatment for marginal keratitis (topical steroid and antibiotic drops, topical lubricant drops, systemic oral anti-inflammatory, oral doxycycline, lid hygiene for associated blepharitis), to which he responded well. The IOP, however, was not adequately controlled with medications alone in right eye and we performed a trabeculectomy with mitomycin-C in right eye. Postoperatively, he had satisfactory IOP control. Postoperatively, at the 6th month, his IOPs were 10 and 14 mm Hg in the right and left eyes, respectively. His left eye IOP was controlled on medication alone (timolol 0.5% and latanoprost 0.003%). Espana et al. 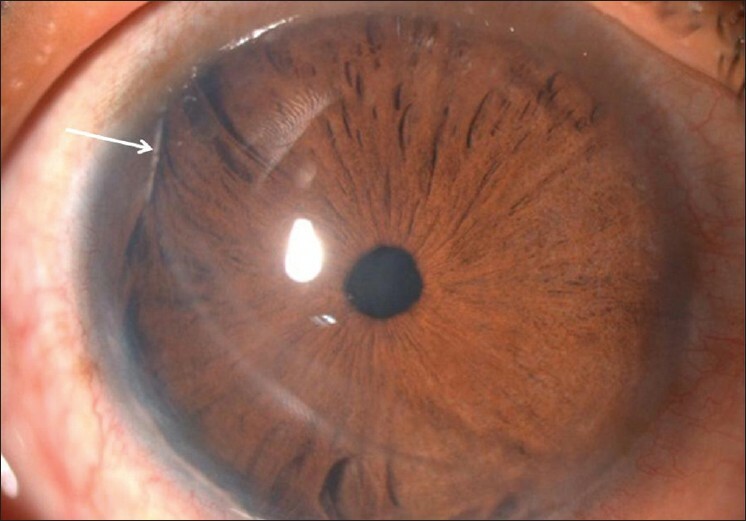 recently reported a nearly similar clinical picture of bilateral detached Schwalbe's line in the anterior chamber in a 37-year-old patient of A-R syndrome. Our patient had iris tissue strands attached to this cord-like structure and gonioscopy clearly showed its origin at the level of Schwalbe's line. To our knowledge, this is the first case report describing a detached Schwalbe's line with attached iris tissue strands in the anterior chamber in a case of A-R syndrome. Impaired neural crest cell migration and differentiation during embryonic development are considered important in the pathogenesis of A-R syndrome. Different anterior segment structures like the corneal stroma, Schwalbe's line, iris stroma and trabecular meshwork have their genesis from these neural crest cells. The common origin of Schwalbe's line and iris stroma from the neural crest cells could possibly explain the presence of the detached Schwalbe's line with attached iris tissue strands in the anterior chamber. The hallmark of this case was the presence of unique cord-like structure in the anterior chamber, the nature of which was not immediately apparent. This peculiar picture of a worm- or thread-like structure in the anterior chamber can be worth remembering as a rare clinical sign in A-R syndrome with developmental glaucoma. Lines MA, Kozlowski K, Walter MA. Molecular genetics of Axenfeld-Rieger malformations. Hum Mol Genet 2002;11:1177-84. Shields MB. Axenfeld-Rieger syndrome: A theory of mechanism and distinctions from the iridocorneal endothelial syndrome. Trans Am Ophthalmol Soc 1983;81:736-84. Espana EM, Mora R, Liebmann J, Ritch R. Bilateral prominent Schwalbe ring in the anterior chamber in a patient with Axenfeld-Rieger syndrome and megalocornea. 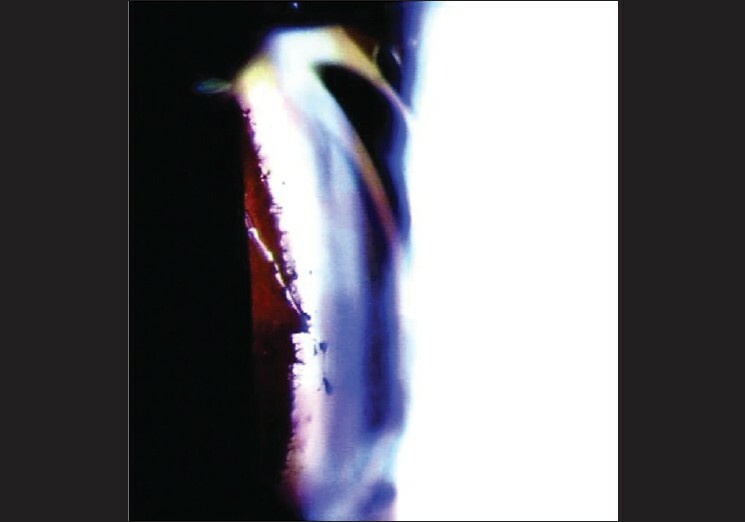 Cornea 2007;26:379-81. Shields MB, Buckley E, Klintworth GK, Thresher R. Axenfeld-Rieger syndrome. A spectrum of developmental disorders. Surv Ophthalmol 1985;29:387-409. Chambers D, McGonnell IM. Neural crest: Facing the facts of head development. Trends Genet 2002;18:381-4.